Easy To Thread Spiral Eye Needles | OhGizmo! 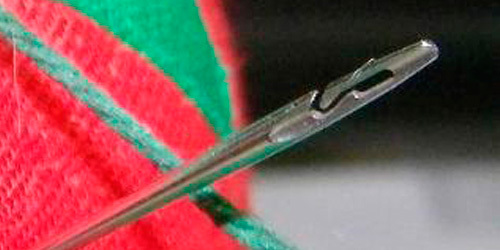 They can be ordered in a variety of different sizes starting with a Size 4 Sharp Standard Needle up to a Size 26 Tapestry Needle for cross stitching, all for $5.50 a piece. Now I’ve never bought a needle in my life, so I don’t know if that’s expensive or not, but I’ve threaded enough needles to know they’re worth every penny. This is a very clever idea. I remember growing up, when my mom would make little twelve-year-old me thread needles for her because she didn't have a steady enough hand or a keen enough eye to do it herself. Really, I can't believe someone didn't come up with something like this sooner. It seems so simple. :o) But, then again, all of the greatest inventions seem to be that way, right? I mean, look at the Snuggie! One of those things that boggles the mind. People have been struggling for hundreds of years to thread a needle and all we ever needed was this thing. I wouldn't call the Snuggie a great invention. It's cheap and thin. Maybe I'm not old enough to have this issue yet. But I can see the want for this.